Body hives are raised, flat-topped bumps / welts on your skin that are smooth to the touch and typically red in color. They are often incredibly itchy and are usually accompanied by a burning or stinging sensation. Body hives are a type of physical hives that occurs all over the body, with no bearing on the initial area bothered. 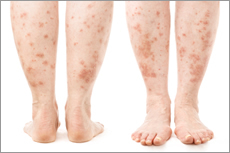 Hives are commonly referred to as urticaria, and body hives are simply a case of hives that takes place over the entire body. Body hives are brought on by many things including cold, heat, stress, emotional changes, illness or disease, sun exposure (see sun hives) infections, allergies to foods or medications, etc. There are many cases where a patient has body hives and a doctor simply cannot find the initial cause of the hives. This is called idiopathic body hives, and is very common. Some people are able to find their triggers, or causes of body hives by undergoing many tests such as pin prick tests or RAST testing. These can be expensive tests (starting at $300), so most people prefer to simply try a hives treatment first as they are much less expensive and invasive. Remember that hives are an allergic reaction the body has to certain things. You may be allergic to pollen and never have hives, even after coming into contact directly with pollen on your skin. However, you may have never known you were allergic to a certain detergent and used it to wash your clothing in, and break out in a body hives attack. Body hives will generally show up within minutes after the allergen has come into contact with the skin. Body hives can last for as little as a half hour and as long as a few days. Severe cases of body hives can come and go for weeks at a time, and are considered chronic hives if they last longer than 6 weeks at a time. It is best to seek professional help if you have never been diagnosed with body hives in the past. What Are The Symptoms Of Body Hives? Body hives offer the same symptoms of all other types of hives: itching and red raised spots on different areas of the body. Body hives can have pain in some instances, and others will feel a burning or prickly sensation. These are normal hives symptoms that can be treated at home in most cases with the right treatment. Body hives can be found on any area of the body localized, such as hives on face, or on the entire body in more severe cases. If you have ever had body hives, you know most doctors simply offer anti-histamine medications or steroids for more severe cases. However, there are over the counter medications such as OxyHives that have proven very effective. Body hives can be very serious if a hives treatment is not taken, and can cause fainting, breathing issues due to swelling and even death depending on the situation. In addition, if swelling of the tongue or lips begins, it is best to seek professional help immediately due to the possibility of anaphylactic shock or blockage of the wind pipe. How Do I Get Rid Of My Body Hives? We recommend a particular hives treatment (OxyHives) that has no harmful side effects and has proven to eliminates body hives for most people. OxyHives is the only product I have heard actually cures hives without the negative side effects other hives medications have. OxyHives no longer requires a prescription either. Please see our hives treatment page for more information. In 1-3% of body hives cases, a steroid or other medication is recommended. However, please be aware that steroids carry several commonly known harmful side effects: weight gain, liver tumors, jaundice, fluid retention and high blood pressure.